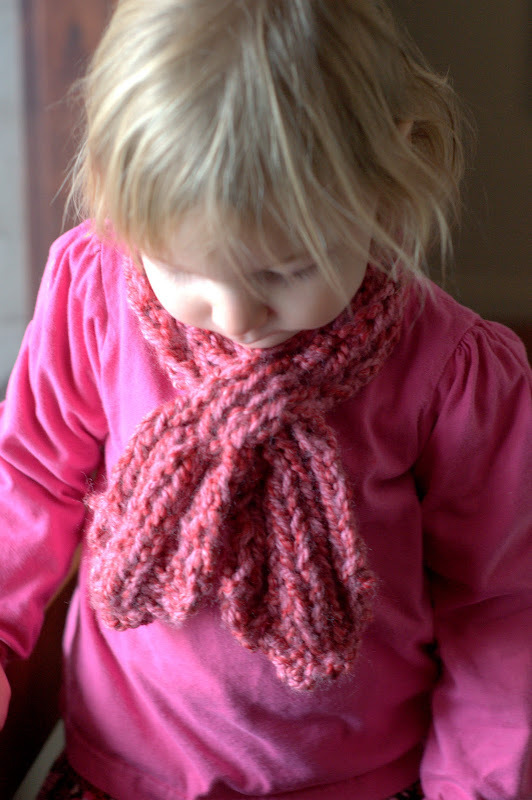 This pink Scarflette is knit using Lion Brand Homespun yarn in Covered Bridge Red (a chunky, cat 5 yarn) and Lion Brand Jiffy yarn in Dusty Pink (another chunky, cat 5 yarn). This pink version may be my favorite because both yarns are a bit fuzzy, but each one I make is my favorite so it probably has more to do with the fact that it's the last one I've finished! I do think after making a few of these now, that for children I prefer yarns with more acyrlic because they are softer and lighter weight. I made this purple Scarflette for Audrey, because it is her favorite color, and because I just had to try another combination. 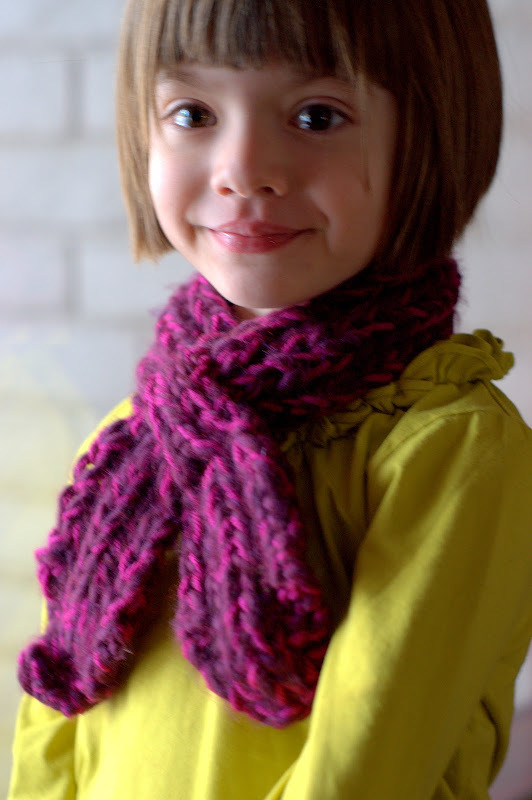 It uses Vanna’s Choice yarn in Magenta (a worsted weight, cat 4) and Bernat Roving in Plum (a chunky, cat 5). I think it looks cute peeking out from her coat. And I also love it with this chartreuse shirt! Such a great color combination. I would love to knit some of these for my nieces. 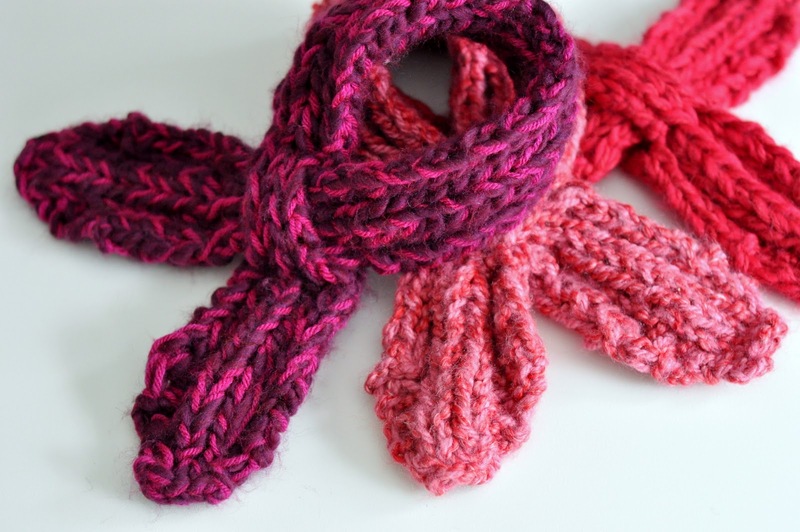 To my advantage is the fact that this project takes just a couple hours and is perfect for stash yarn--you could probably make three Scarflettes from two skeins of yarn if you aren't tempted to switch up the colors. This is the perfect thing for last minute Christmas gifts! Maybe I should knit some for my nephews too. What do you think? 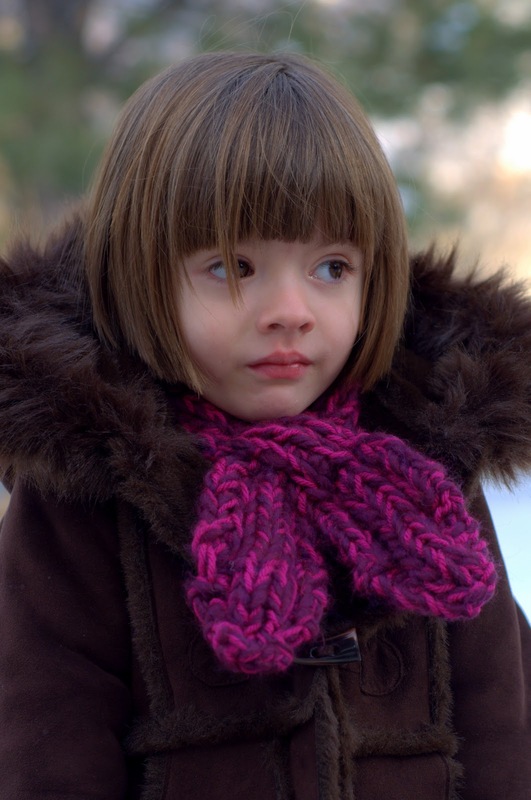 Do you think the Looped Scarflette would work on a boy? I have a women's pattern in the works too. I want one in grass green! If you are interested in the PDF pattern, which includes some tutorial photos, it's here in my Etsy shop. I love these, is there a pattern or tute? @ Amy T: Thanks for your comment. I am selling these patterns in my Etsy shop and currently offering a 25% discount if you use the code in this post! The pattern includes some tutorial photos as well.